Make a list. Create your invitations. Clearly relay the time and address of your event. Tempt guests with your giveaways. Send attendees a reminder email as the event approaches. Clarity and organization are sacrosanct to event managers. It goes against instinct to be anything less. The idea of using secrecy in events is not widely publicized as a marketing or events strategy, but secrecy is much more prevalent in society than we realize. Some companies, such as Apple, use secrecy on a large scale to generate demand. Before the release of a new iPhone, there are whole websites devoted to investigating the phone’s new features, all because they are kept secret. Other companies use secrecy in different ways. At the start of the food truck craze, many trucks would Tweet their location daily and their loyal customers would race through city streets to get their food fix before the truck changed locations again. Even superstars use secrecy to boost sales. Take Beyoncé. Her most recent album was released as a complete surprise. She recorded and produced 14 new tracks and 17 music videos in complete secrecy. Her fans went wild when they woke up one morning to a simple Instagram post from the singer reading “Surprise!” and linking to her new album. If you want to try using secrecy in one of your events, it’s important to remember a few key things. First, you are probably not Beyoncé. To pull off a stunt like hers, you need an extremely loyal following of customers. Using secrecy in event planning can be very fun, but it’s necessary to maintain a balance and not go overboard. Remember to add enough structure to keep your attendees comfortable, but enough secrecy to engage them. So start on a small scale. Try incorporating surprise giveaways into your event, or invite a surprise guest speaker! Secrecy can successfully be used at business events as well. Dell hosts an annual event here in Austin, TX, called Dell Unconference. When Unconference attendees arrive, there are no set schedules or speakers. Instead, the attendees volunteer to lead sessions when they arrive and create the schedule as they go. While Unconference may not be a textbook “secretive” event, its makers certainly engage their audiences in the surprise. Business events can be just as surprising and engaging… it just takes a little creativity and the right technology to pull it off. 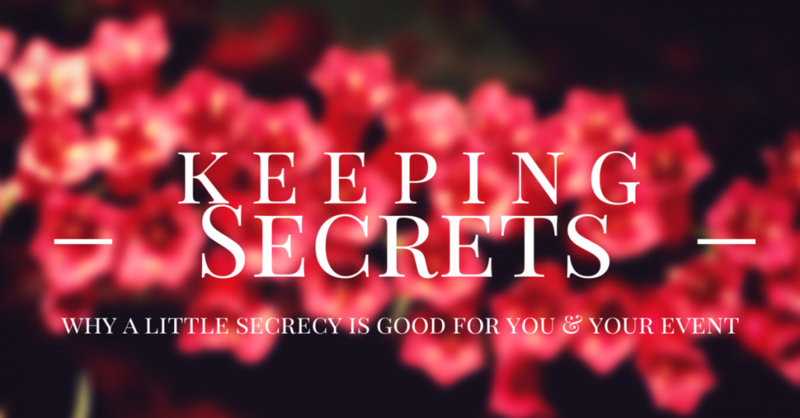 Secrecy can be a powerful weapon to keep in your event arsenal, and it certainly adds some spice to the event management routine. Keep this tactic in mind the next time you’re looking to get creative with your next event. Happy planning!